Smartphones were turned loose on the world in 2007. How many of us have stopped to think that the average fifth grader has never known a world without smartphones? Today’s seventh graders were only two years old in 2007, so it is doubtful they can access much memory before smartphones. These children have always had the power of the internet and everything it brings with it right at their fingertips on their parents’ phones. Now they have it right in their back pockets because the average American child receives his first smartphone at the ripe old age of 10 (Psychology Today). As you might expect, that little number comes with some baggage. Technology is moving so fast that parents often do not have time to get their minds around one gadget or game or social media craze before the next one has kidnapped their child’s attention. Don’t think it is any easier for school teachers and administrators either. Even though student cell phones must be in the backpack, in the locker, and turned off at Trinitas, the residual effect smartphones are having on school culture isn’t so residual. 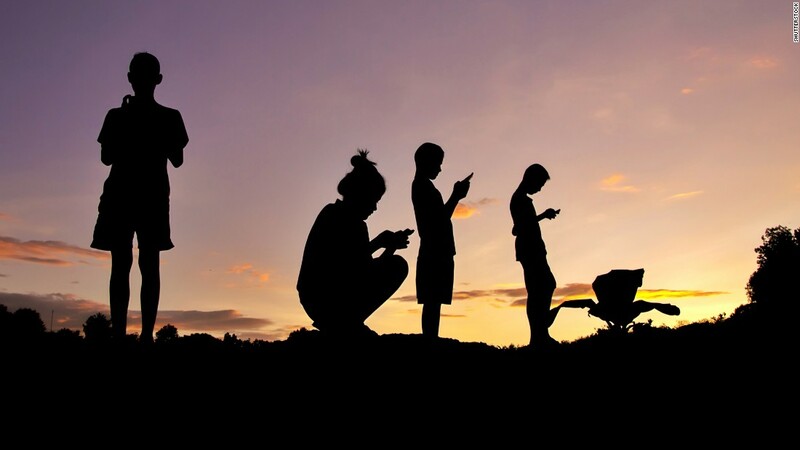 The age group from 10 to 15 years old is the hardest hit because they are not mentally, emotionally, or socially prepared to navigate the enormous responsibilities that come with having a smartphone and the data plan to go with it. Some estimates are that teens spend six to nine hours a day on their phones (Psychology Today). This kind of usage could be considered addiction (or idolatry). Many parents are harrumphing right now because they cannot imagine how their child could spend that much time on his or her phone. I’ll tell you how: they aren’t sleeping! (The Conversation) Just recently a group of pre-teen boys told me that they regularly wake up at 2am to play Fortnite. One of the boys was sheepish about not being allowed to play until 8am; the others teased him. … we found that social media use was significantly correlated with depression for girls … Developmentally, girls are more concerned with physical appearance and social popularity than boys are. Social media is a showcase of those issues, even quantifying them in numbers of likes and followers. Girls also spend more time on social media. As it turns out, girls’ reactions to how they are perceived on social media can be dangerous. In fact, self-harm among girls between the ages of 10 and 14 has tripled since 2009. And by self-harm, I mean cutting or poisoning or something else serious enough for an ER visit. In short, our teenage daughters are looking for love in all the wrong places and are hurting themselves when they don’t find it (Psychology Today). As a parent talking to other parents, I want to ask you a few questions. Does your child really need a cell phone, especially a smartphone, before he or she is driving? Does your teenage son or daughter have unrestricted access to the internet? Does he or she keep the phone in the bedroom? Do you have a way to check what the phone is being used for? I firmly believe we are giving our children far too much freedom on the internet before they are mature enough to handle it. The effects on our culture are widespread, of epidemic proportions really. It is a disaster we are bringing on our own children. And why? For what reason? If our best answer is that everyone else is doing it and we can’t bear to tell our children no, then we need to carefully count the costs because they are high. I have only scratched the surface in this little blog. I encourage parents to do their own research. It will be well worth your time.